To help you get started on this wonderful hobby, let’s look at the basic makeup of general scrapbooking layouts. You’ll quickly notice that most scrapbook layouts will contain most of the elements listed below. These are the “standard” elements. But of course, you don’t have to use all the elements at the same time. Usually, it’s a matter of picking and choosing elements that best help you convey the story you want to tell. Get to know these standard elements and then go about experimenting with using as many or as little of them on your scrapbook pages. Photos are the the essence of scrapbook layouts. Most scrapbooking pages will have at least one or multiple photos on them. That said, occasionally you can create an effective layout without a stitch of photo where the emphasis is mainly on the journaling. 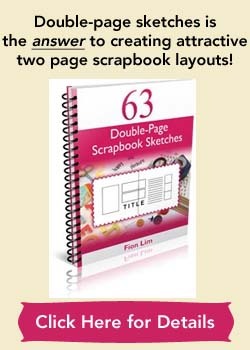 The words that highlight, summarize or suggest the page theme on scrapbooking layouts. You can use famous sayings, names, or simple phrases as page titles. A title doesn’t always have to be at the top of the layout. It can be placed anywhere as long as it catches the viewer’s attention. Usually the viewer’s eyes will scan the layout for the title when looking at a layout. Then again, a scrapbook layout doesn’t always need a page title. There’s many ways to creating page titles. Some examples, handwrite or stamp your titles, use computer-generated fonts, use stencils to draw out your titles, use alphabet stickers, or use acrylic paint to write out your titles. Text that expands or explains the story of the photos. Journaling doesn’t have to be related to the event of the photos all the time. You can write out short descriptions including names and dates, heartfelt letters, captions, basic information, quotes, lyrics and even poems. You can write directly on the background paper. You can also write in journaling boxes using cardstock, patterned papers, vellum or other textured papers. Sometimes, your journaling is very personal and you prefer to keep it more private. In such instances, you can find ways to hide your journaling. For example, you can slide your text into an inconspicuous pocket, or create a discreet lift-up flap to conceal your text. Any embellishment used to dress up a scrapbook page. Include stickers, silk flowers, slide mounts, buttons, ribbons, brads, eyelets, and such to enhance the attractiveness of the layout. Page accents should support the page theme and not overwhelm and take away attention from the photos. The layer underneath a photo which leaves an all-around border that helps the photo to stand out more. A mat can be made of cardstock, patterned paper, acrylic paint and other decorative elements. A mat can also be thin, thick, dimensional, flat, plain or elaborate depending on the effect you want to create. You don’t have to mat all the photos. You can just mat your focal-point photo. If you want a “boxy” look to your layout, you can choose to mat all the photos and then double or triple-mat the focal-point photo for extra attention. Okay, the traditional photo corners are used as anchors to affix photos to a page with ease of removing them later. In scrapbooking layouts, photo corners are mainly decorative elements to draw the eye to the photo. Ribbons, brads, page turner and flowers can all be used as photo corners to embellish a photo and call attention to it and make it outstanding. Borders add visual interest to anywhere you decide to place it on. There’s many ways to create interesting borders. Decorative borders can be created from a variety of materials. You can even embellish the borders with photos and text. You can also design them with cardstock, patterned papers, fabric, tags, charms, metal and many more. Now that you know the basic elements of scrapbooking layouts, you’re ready to have fun and get started on creating your first layout! But you might not know what basic supplies you’ll need, so read about the suggestions on essential supplies here. Very helpful page. Thank you! I’m glad you find this scrapbooking page useful. I hope it gives you a good overview of the scrapping process. Happy scrapping! 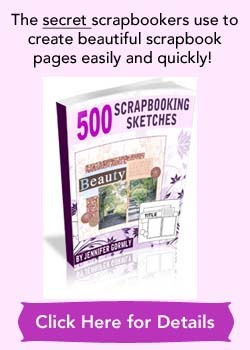 This has been a great help in getting me started on my scrap book projects. I am planning to do at least 5. But I want to keep them simple. Happy to hear that this article is helping you to get started! Keeping your scrapbook designs simple is a good idea especially when you have in mind several projects to get going. If you find yourself stuck on arranging all the elements for each page, do try using scrapbook sketches which can be very time-saving. Found it pretty simple, but still find it hard to figure out where to start. Yes, the concept of scrapbooking is rather simple, and yet it opens up a whole new world of creative possibilities. Just did my first page yesterday. Scrapping with my daughter-in-law. I looked through some photos until I found a simple event: 3 photos of family in tulip fields. Looked through some simple scrapbooking ideas online. Found inspiration. Chose paper (main and border), framing, title. Page isn’t quite complete. Need a closeup photo of a tulip. Otherwise finished. Today I’m going to start my first scrapbook project! :) Of course I am happie that I found your website, very useful. I just got a plain scrapbook, and I don’t know how to make perfect colors. Help me out please. I hope you start on your first scrapbooking project! You’ll have fun and it’s rewarding as you create more scrapbook pages to store your favorite life memories. As a start, don’t worry about getting it perfect. For color schemes, there’s a few ways you can pick out colors for your layout. 1. Look to your patterned paper and pick out 3-4 colors to used on your layout. 2. Look through magazines or catalogs and see if there’s any color schemes that attract you. 3. You can visit color schemes websites such as ColorCombos.com or ColourLovers.com for ideas on color schemes. 4. Keep it simple by using monochromatic colors – using different shades or tones of a single color. I am about to attempt a scrapbook page to send to someone. I have some 12×12 black card, photos matted. I have the layout in my head. But what sort of card do I mount my black card on to. Thickness? Weight? I bought some thin chip board, but having problems mounting the black card. What glue? I was told PVA but getting into all sorts of problems with lumps and bumps, I tried smoothing it out but that’s not worked. Help please!!! Hi… it was really helpful and easy to understand. Thanks alot. :)I’m gonna make one! Happy to hear that you’ve found the info helpful! 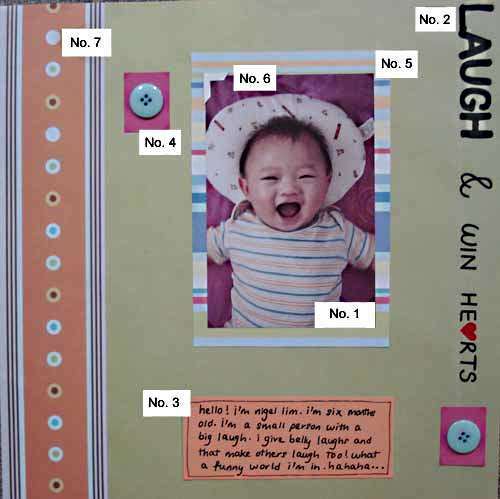 Have fun in creating your first scrapbook layout! Your website is wonderful and put me on the right track to get started at scrapbooking!!!! I intend to make a scrapbook for each of my children who are 25, 23 and 21! Hope they enjoy them as much as I will enjoy making them!!!!! Thank You!!! I can feel your excitement and enthusiasm on embarking on your scrapbooking adventure! I’m happy that you find my scrapping information helpful. I’m sure your kids will appreciate and treasure the love, time and effort you put into documenting their memories. Have fun! Hi, I am new to scrapbooking, I never started yet. How to do it? Hello, I am new to scrapbooking and trying to figure out where to start. I have my picture out and do not know how to outline it. I have looked at so many videos, so I hope you can help ease my mind. The best way to start scrapbooking is to start making a scrapbook layout. :) When you’ve created your first scrapbook layout, you’ll have gone through the process of scrapbooking and will gain some confidence in this fun papercraft. There’s really no right or wrong way to do it. It’s your layout, your picture and your creativity. So don’t get too stuck with overthinking. Look at your photo, choose 3 or 4 complementary colors from the photo and use these colors while choosing your scrapbook papers. Choose a scrapbook layout you’ve seen online or on this website for your inspiration, and start building up your layout by following the arrangement of elements of that scrapbook page using your own photo and chosen scrapbook paper. Of course, you can always change the placement of elements to suit your liking. Just start creating your first layout and then try out your second layout, and your third and so on. As you create more layouts, you’ll get better and soon it’ll get easier. Have fun! I am going to do a scrapbook for my sister’s daughter for her first birthday. I would like to know were I can get a scrapbook? Please help me out. You can go to your local craft store or scrapbook store to get a scrapbook album. If you don’t have one near you, you can try getting it online from stores such as Amazon.com or Scrapbook.com. You can check out these basic supplies to get you started.